In the last 3-4 years, the number of postdocs on campus has gone up from 12 to over 90, now. Thus, there was a need for setting up a formal postdoc community. 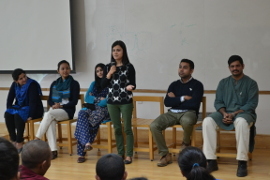 On 16th Feb 2015, the Bangalore-Bio cluster postdoc Association (BBA) was formed and a steering committee was elected to take charge of activities. Postdocs can reach the members at pdfa at ncbs dot res dot in with any query. We aim to not only ensure greater interaction between the postdocs on campus but also work towards providing avenues to develop skills, through symposiums/workshops, to enable postdocs for a smooth transition.